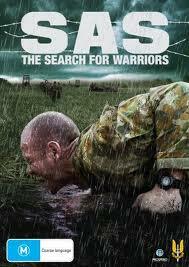 SAS The Search for Warriors DVD Review This was compelling viewing that would interest anyone, not just those interested in the military. I was utterly amazed at this DVD! Having more than a passing interest in things military, for years I have wondered what it might be like to try out for, or even be in the SAS. This DVD and its two episodes, takes you behind the scenes and shows you a little of what it takes to be one of these elite warriors. 130 candidates are allowed to participate in this gruelling 21 day program from all the services to take part in what is the most exhaustive processes in the military. Physical and mental boundaries are pushed to their limits as the men try their utmost to make it through the trials in order to be allowed to wear the elite beret with its Who Dares Wins badge. SAS The Search for Warriors shows us how the SAS strips down elite fighting men so that they can be moulded in the way the SAS needs them to be. Each step is explained by the officers in charge of the SAS or by the narrator who guides us through the feature. Whilst some of the processes seem inhuman or demoralising, they are fully explained so that viewers get an insight into why they are being done, and also why some of the candidates are simply not suitable to join this elite group. There are no extras on this disc and really why would there be? This is a real life feature where you have to admire anyone who would volunteer to serve their country in this outfit. One thing that really stood out to me was that as bad as it got during the testing shown on this DVD, this was to cull out those who wouldn't be suitable for the real SAS training that takes place AFTER these 21 days of hell. Now that is some training that I would love to know more about. The disc does adopt a bit of a reality TV approach at times, following the progress of a couple of the soldiers, not all of whom make it through the arduous process. You will find yourself cheering for some and judging others, but ultimately remember that these are all real people who simply want to serve at the highest level of our armed forces. As such whatever their motivations, they are to be admired. This was compelling viewing that would interest anyone, not just those interested in the military.